Home » Miscellaneous » Jacques Maritain: "Some Reflections Upon Religious Art"
Jacques Maritain: "Some Reflections Upon Religious Art"
The following is a short address given by Catholic philosopher, Jacques Maritain, titled "Some Reflections Upon Religious Art" -- later published in Art and Scholasticism. 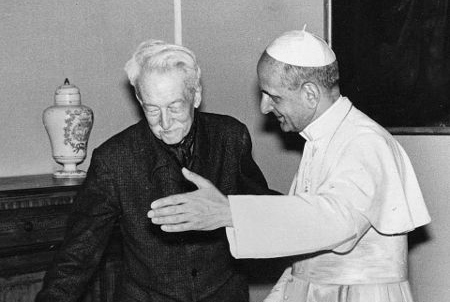 In this essay, given in 1924, Maritain looks critically at certain kinds of devotional Catholic art which came out of the sentimentalism of the Victorian era in the form of low cost, mass produced objects. This is the sort of art that we would usually term "l'Art Saint-Sulpice" and this essay may help to ground this concept for those not yet familiar with it. It is still prevalent and it is still indeed popular. At the same time, Maritain acknowledges the issues that were already being manifest at that time in terms of "modern" approach to religious art in counter to this former trend but which were also found to be lacking. Allow me to put before you today some very brief and very simple reflections. You will, no doubt, consider them too simple, but still I hope that they are inspired by good sense. What I should like to examine with you very rapidly is the present state of relations between Catholic artists and the Catholic public. We must observe right off that in general they are not very satisfied with one another. And as in family quarrels, we must no doubt say here too that there are "faults on both sides," and that each side has some good reasons for complaining. Just about everything has been said about what is called the art of Saint-Sulpice -- an ill-chosen phrase, it must be said, and one that is very insulting to an estimable Parisian parish, the more so because the scourge in question is world-wide in scope; about the diabolical ugliness, offensive to God and much more harmful than is generally believed to the spread of religion, of the majority of the objects turned out by modern manufacture for the decoration of churches; about the kind of bitter contempt that still reigns in some "respectable" circles with regard to artists and poets; lastly about the absence of taste and artistic formation that makes so greatly to be desired the establishment in seminaries of courses in aesthetics or the history of art such as Pius XI, before his elevation to the Pontificate, organized at Milan. Yes, indeed; but on the other hand there are a great many parish priests who ardently desire to fulfill the wish of Pius X, "to have their people pray before beauty," and who are trying to rid their churches of the products belched forth from the cellars of religious mercantilism. Yet many of these, we must candidly confess, are not satisfied with what is proposed to them in the name of modern Art. I am clearly not referring to a few superior works, but to the average run of works produced these last few years. Our affection for our friends must not prevent us -- rather the contrary -- from stating what may still be lacking in an effort that in other respects commands our heartiest admiration. And I say that often these parish priests are right, for their office, let's make no mistake about it, is not to encourage the fine arts, but to give the faithful that which answers their spiritual needs, that which can truly serve the religious life of a Christian community. One sometimes sees them driven to fall back in despair upon the art of Saint-Sulpice. Why? Because these products of commercial manufacture, when they are not too disgusting, have at least the advantage of being perfectly indeterminate, so neutral, so empty that we can look at them without seeing them, and thus project onto them our own sentiments; whereas certain modern works, and the most agitated and impassioned among them, seek to impose on us by violence the individual emotions, exactly as they are -- in the brute state, and with all that they have of the most subjective -- of the artist himself. And in praying, instead of finding oneself before a representation of Our Lord or some Saint it is an unbearable torture to receive full in the chest, like a blow of the fist, the religious sensibility of Mr. So-and-So. The present difficulties, to tell the truth, stem from deep-seated causes, and in the end from the crisis of our whole civilization. Religious art is not a thing that can be isolated from art itself, from the general movement of the art of an age: isolate it, and it grows corrupt, becomes dead letter. But on the other hand the art of a period carries with it all the intellectual and spiritual stuff that constitutes the life of this period; and notwithstanding all the rare and superior qualities contemporary art may possess in the order of sensibility, quality and invention, the spirituality it conveys is often quite mediocre and sometimes quite corrupt. This is why Christian artists find themselves faced with very grave difficulties. On the one hand, they have to reaccustom to beauty the faithful, whose taste has been spoiled for more than a century past -- and we must not forget that, given the purpose for which it is intended, religious art, as prescribed by Urban VIII on March 15, 1642, and by the Council of Trent, must not have an "unfamiliar" character -- and so it is a question of destroying bad aesthetic habits while restoring a good one: no easy task. On the other hand, in order to recover a truly living religious art, they must lift up, spiritualize, and bring to the feet of God all of modern art: no easy task either. It is true that by this very fact the Christian artist, if he has the genius, is in a privileged position to profit from the whole modern effort. What follows from all of this? It is only too evident that the Catholic public would fail in an essential and particularly urgent duty if it failed to understand the capital importance of the task undertaken with admirable generosity by so many artists who are working to reintroduce sensible beauty into the house of God, if it did not effectively support them, and if, even when it does not approve of this or that work in particular, it did not surround them with a fraternal sympathy. But it is also clear that Catholic artists for their part must make every effort to understand the legitimate needs of the faithful, for whose common good they are working, and to ascertain, courageously, the proper conditions and exigencies of the task to which they are devoting themselves. But, it may be asked, cannot certain of these conditions be stated? I think, in any case, that a few elementary truths which force themselves upon us concerning religious art can be disengaged, which, if they were universally recognized, would doubtless facilitate concord between the public and artists. Allow me to attempt to formulate some of them, ones on which, I believe, all of us here are agreed, and which correspond to the common sentiment of all our friends. There are, however, it seems to me, in the technical order, two requisite conditions for religious art as such, granted its special object and the purpose for which it is intended. 1. It must be legible. For it is there above all for the instruction of the people, it is a theology in figures. An illegible, obscure and Mallarméan religious art is as absurd as a house without a staircase or a cathedral without a portal. 2. The work must be finished. I do not mean finished in the academic sense, but in the most material and humble meaning of this word. It is supremely fitting that nothing enter the house of God but work that is well made, complete, proper, durable, honest. This must clearly be understood according to the mode peculiar to the style and the means adopted, but the facility with which in our day one is satisfied with oneself makes it necessary to insist on this point. Second Observation. Sacred art is in absolute dependence upon theological wisdom. In the signs it presents to our eyes something infinitely superior to all our human art is manifested, divine Truth itself, the treasure of light that was purchased for us by the blood of Christ. It is above all for this reason, because the sovereign interests of the Faith are at stake in the matter, that the Church exercises her authority and magisterium over sacred art. I recalled a moment ago the decree of Urban VIII of March 15, 1642, and the prescript of the 25th session of the Council of Trent. There are other instances. On June 11, 1623, the Congregation of Rites proscribed crucifixes representing Christ with arms updrawn. On September 11, 1670, a decree of the Holy Office forbade the making of crucifixes "in a form so coarse and artless, in an attitude so indecent, with features so distorted by grief that they provoke disgust rather than pious attention." And you know that in March, 1921, the Holy Office forbade the exhibition in churches of certain works of the Flemish painter Servaes. Here is a point that merits all our attention. Servaes is a painter of great talent, a Christian full of faith, and one can only speak of his person with respect and affection; I am happy to bear testimony to him here. The Stations of the Cross which raised such violent commotion in Belgium gave birth to deep religious emotions in certain souls, nay more, brought about conversions. Nevertheless the Church condemned it, and it is never difficult, even when the appearances and the human procedures disconcert us, to understand the wisdom and justice of the Church's decisions. In spite of himself, assuredly, and not in his soul but in his work, the painter, fascinated by the Ego sum vermis et non homo of Isaias and conceiving his Stations as a pure vertigo of grief, happened to be false to certain theological truths of capital importance -- above all the truth that the sufferings as well as the death of Our Lord were essentially voluntary, and that it was a divine Person who suffered the most appalling human suffering: the pain and agony of His Humanity were handled by the Word as the tool with which He performed His great work. At the same time, for those who cannot harmonize the poor figurations that art places before their eyes and the pure image living in our hearts of the most beautiful of the children of men (in Him, as in His Mother, as Cajetan reminds us in his treatise De Spasmo beatae Virginis, the supreme torments of Calvary, though piercing the mind still more cruelly than the body, left reason intact under the Cross, in full exercise of its dominion over the sensitive part) -- for these, I say, certain plastic deformations, a certain degenerate aspect of the contour, take on the value of an offense against the Humanity of the Savior, and, as it were, of a doctrinal misapprehension of the sovereign dignity of His soul and body. At a time when the truth of the Faith is threatened on all sides, why be surprised that the Church is more concerned than ever about the doctrinal distortions that can be implied in certain works of art intended for the faithful, whatever may be in other respects their aesthetic value and the salutary emotions they may here or there excite, and whatever may be the piety, faith, depth of spiritual life, and uprightness of intention of the artist who produced them? May I be permitted however to add that from this same point of view of dogma the base sentimentality of so many commercial products must equally vex sound theology, and is doubtless tolerated only as one of those abuses to which we resign ourselves for a time, considering human weakness and what may be called, adapting a phrase of Holy Writ, "the infinite number of Christians with bad taste." This ultimate control by theology that I just mentioned, and which presupposes in the artist a true theological culture, clearly does not impose on sacred art any aesthetic genre, any style, any particular technique. We must, however, realize that it communicates to it, as it were spontaneously, certain general directions. Thus the intrinsic characteristics of the object represented have assuredly for sacred art a very special importance: not, certainly, from the point of view of the naturalist imitation of material detail and picturesque appearance, which is more out of place and execrable here than elsewhere, but from the point of view of the laws of intellectual signification. If one reflects on the essential deficiency of the means of expression of human art in relation to the divine mysteries to which these means are applied, on the terrible difficulty of expressing in a sensible matter truths that bridge heaven and earth and unite the most opposite realities, one is even led to think that sacred art, however rich it ought to be in sensibility and humanity, in order to attain to a certain spiritual fullness will doubtless always have to retain something of the hieratic and, so to speak, ideographic symbolism, and, in any event, of the sturdy intellectuality of its primitive traditions. Third Observation. A last point -- a very simple one -- is that a work of religious art must be religious. Otherwise it is not beautiful, since beauty presupposes essentially the entirety of all the requisite conditions. As Paul Cazin remarked, tell an artist dealing with a religious subject "that he has produced a masterpiece, but that his masterpiece is not religious, and you will pain him greatly. . . ." And Cazin continues: "God alone can touch men's hearts with a feeling of piety before the most miserable chromolithograph or the most distressing daub, as well as before the most sublime masterpiece." That is true, but it does not prevent the fact that normally certain works have of themselves a value, a radiance of religious emotion, of interior illumination, and, properly speaking, of sanctification. Nevertheless, repeating once more what Maurice Denis has said, this does not depend on the subject itself. Nor does it depend, I am convinced, on the recipe of a school and a particular technique. It would be a great delussion to think that clumsy angles and a humble subject matter are the necessary means of expression of a Franciscan emotion, or that a geometric stiffness and dull, austere tones are required in order to give to a work the seal of Benedictine dignity. There are no rules for giving an art object a value of religious emotion. This depends, on the contrary, on a certain interior freedom with regard to rules. One achieves it only by not seeking it directly, and only by participating, in one manner or another, in the spiritual life of the Saints: something which the common Christian atmosphere of an era of faith made easy for artists, even when, from many points of view, they remained far from the examples of the Saints, but which, of itself and in the absence of exterior aids, requires in the soul the habitual radiance of the theological virtues and supernatural wisdom. And it is necessary, besides, that the virtue of art not remain separate, isolated from this wisdom, because of an insufficient mastery or of false academic principles, but that between the two contact be made, and that this wisdom freely use the virtue of art as a supple and infallible instrument.